Yesterday the Photography and Modelling Society presented the Annual Fashion Show in Eliot Hall at the University of Kent. Each year, the society organizes this event, in which students from the university get on the catwalk to present clothes from local shops and designers. The sets for this show were Slaters Menswear, Kaliko Minuet, Bhs Casual, Animal, Fancy Dress, Recycling, Noa Noa, Fat Face Streetwear, Bhs Bedwear, Fat Face Summer, Punky Fish, Unique, and Armoire. The show also featured guest performances from the UKC Capeira Society and the UKC Circus Society. The proceeds from this year’s show went to Save the Children’s Haiti campaign. 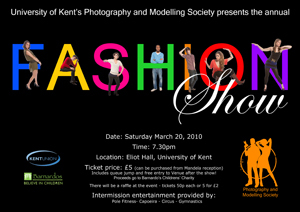 This entry was posted on Monday, March 22nd, 2010 at 00:28 and is filed under University of Kent, video and tagged with Animal, Armoire, Bhs, catwalk, Eliot Hall, fashion, Fashion Show, Fat Face, Kaliko Minuet, Noa Noa, Photography and Modelling Society, Punky Fish, Slaters, Unique, University of Kent at Canterbury, video. You can follow any responses to this entry through the RSS 2.0 feed. You can leave a response, or trackback from your own site.